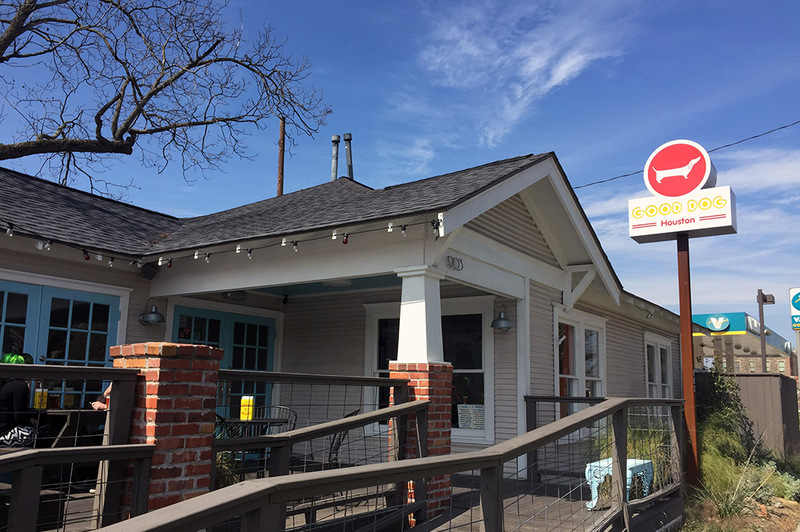 Good Dog Houston is located in the heights just north of I-10 in a neat old house that has been converted into a cool new restaurant. The décor is what you would expect in the Heights and that really helps bring this ole’ hot dog spot all together. Although I call this a hot dog spot, I have to say that Good Dog Houston is so much more. 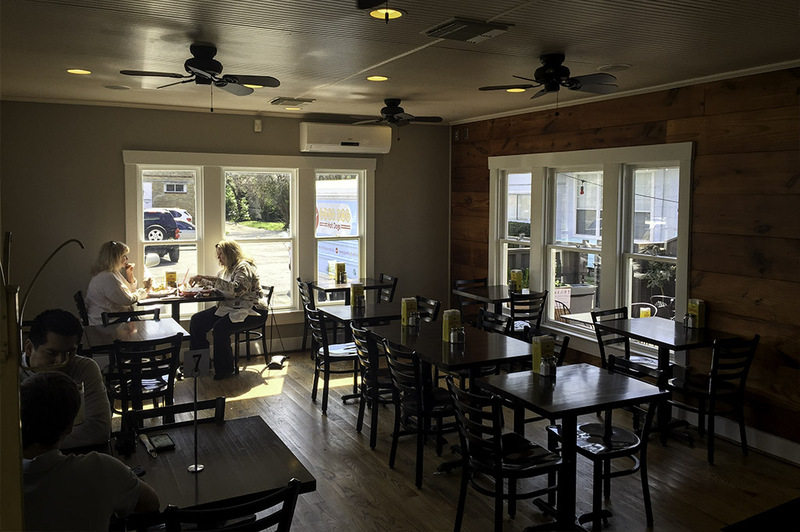 The first thing you notice as you head towards the building is the big front patio, a great spot to eat outside and enjoy the day, as long as the weather permits, of course. When you walk into Good Dog Houston, you are immediately greeted with smiles. I walked straight to the bar and in no time ordered a craft beer. 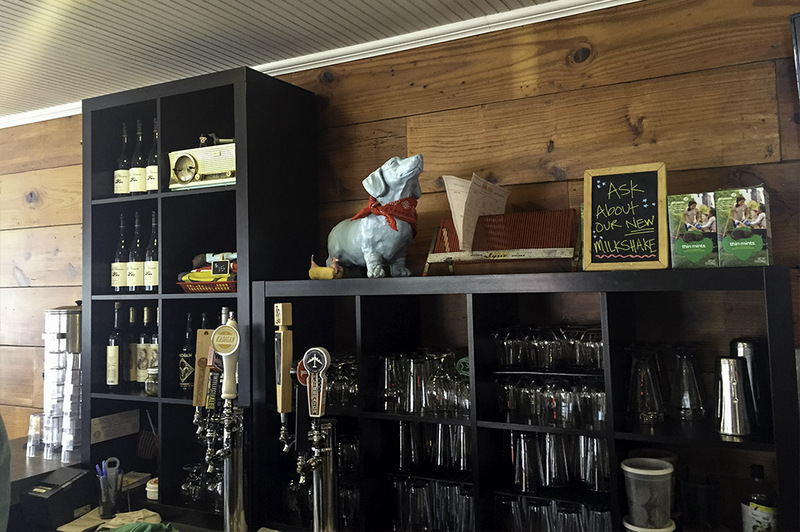 I was happy to see that Good Dog Houston has a wide variety of Top Texas Craft Beers on tap. That makes me hoppy, hoppy, hoppy! I decided to try the Independence – Hoppy Driver, a session IPA. I was very glad I did as it really hit the spot. The guy at the bar was very friendly. I let him know that I grew up in Southwest Houston, but have been living in San Diego for the past 10 years. 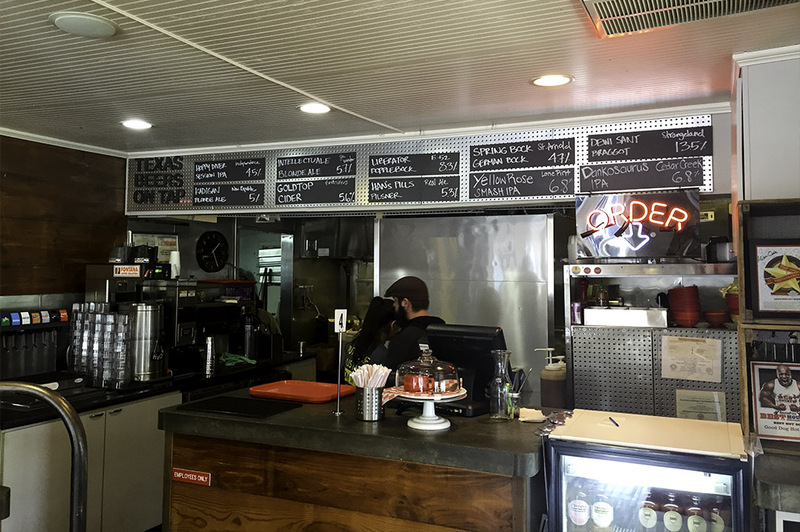 We went back and forth on some of our favorite restaurants in both areas and he gave me the lowdown on Good Dog Houston. 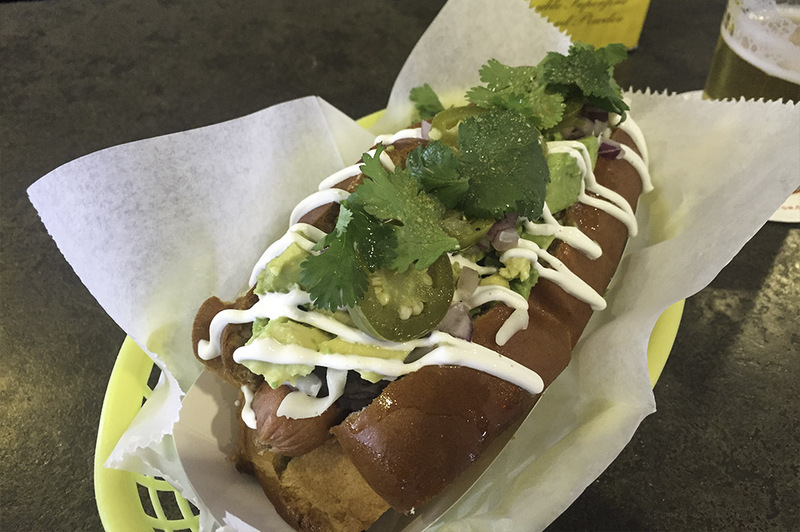 Good Dog Houston started out as one of the first group of gourmet food trucks in the area and, living the dream, it has grown into the brick and mortar business I sit in today. 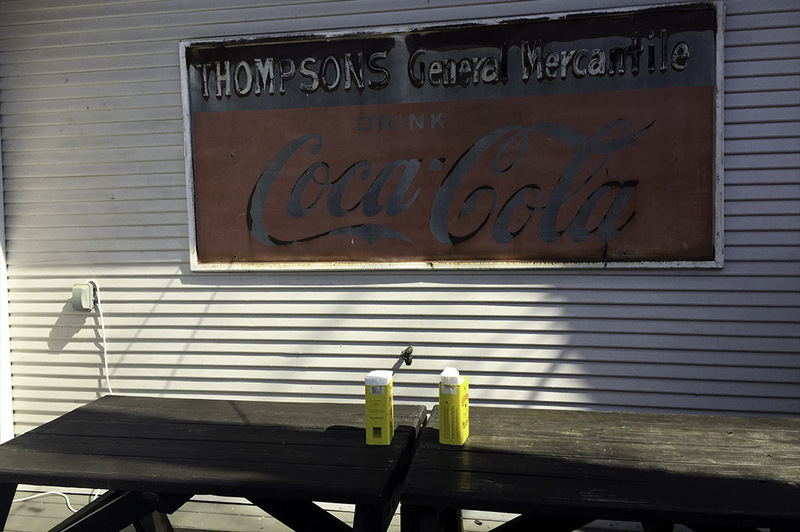 An amazing story and it just goes to show that, with a little tenacity and elbow grease, great things can be accomplished in the Lone Star State! 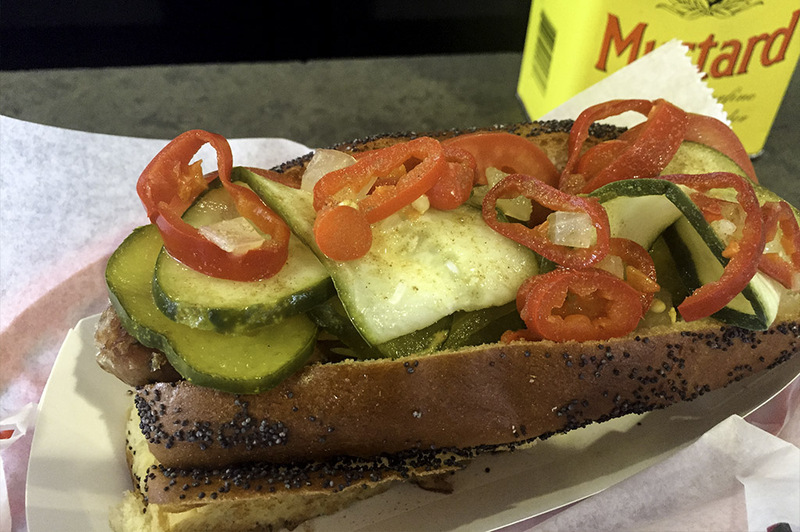 So, like I usually do… I, of course, asked my new friend what he suggested we should experience at this hot dog mecca. 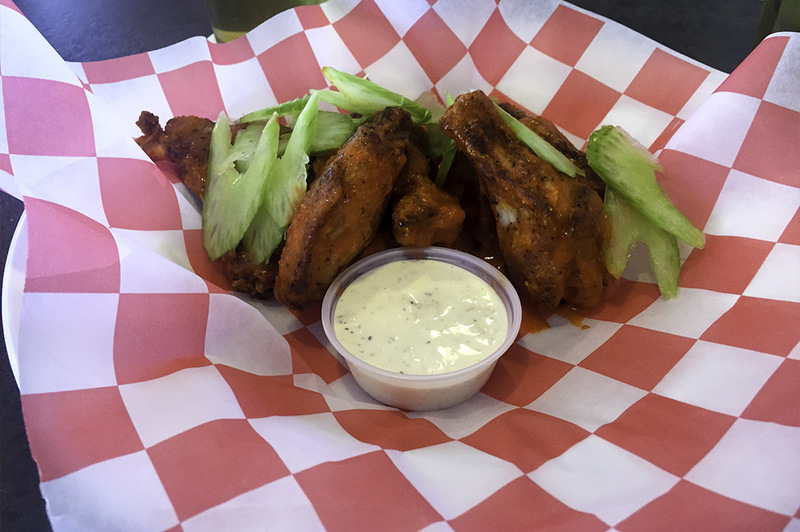 Surprisingly enough, he recommend we have the wings as an appetizer while looking over the unique menu of dogs. Now, I wasn’t upset he suggested wings, just a bit thrown off. Wings and craft beers are the two things I could never live without, so bring ‘em on! As for the wings, you’re not looking at multiple flavors and styles, just one, smoked. But these wings easily make the top 5 list of the best I have ever tasted! The Good Dog Houston Holy Smoked Hot Wings are unlike any wings I have ever eaten. 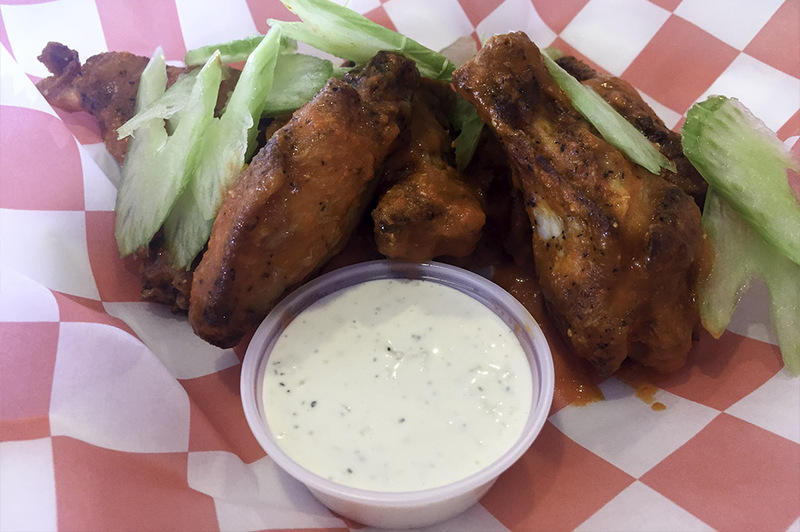 The wings are first smoked, then flash fried with the house habañero hot sauce (most of the sauces and condiments are homemade here) and served with celery and homemade Ranch dressing. I nervously had to decide whether or not to dip the deliciously smoked wings into the wonderfully creamy homemade Ranch. I decided to take turns, as I wanted to get the full smoked Texas flavor of the wings, but also enjoy the homemade Ranch. Wow, who would think a hot dog joint could be so pleasantly complicated? Wings prepared this way are one of those things that make you think, why didn’t I think of that? 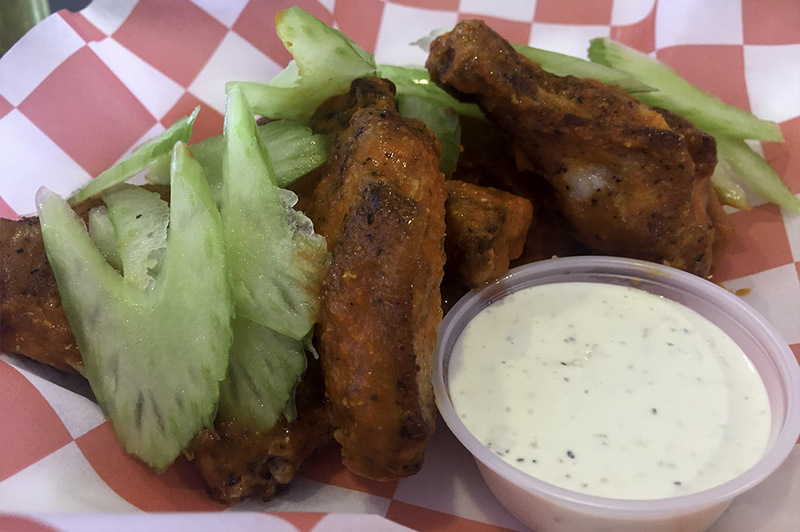 I forbid you not to order the smoked wings as an appetizer on your visit! Now for the main event! I must see what all the hype is about. 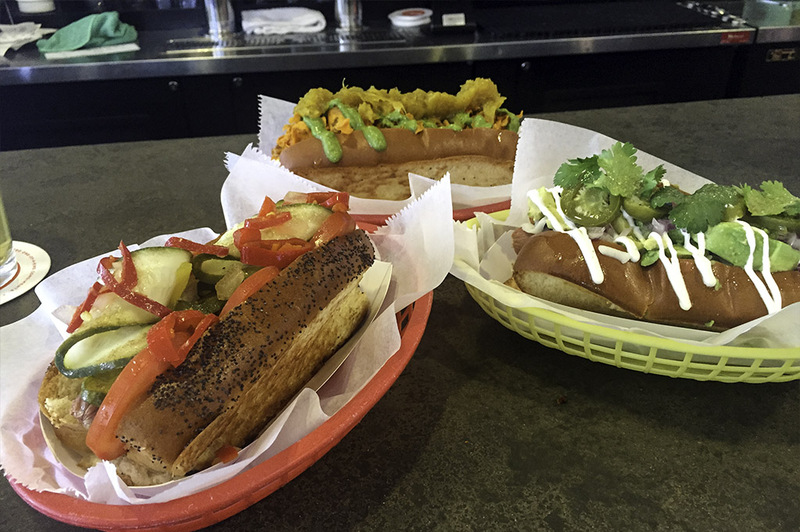 We had gotten an abundance of recommendations for what has been publicly stated as being one of the best hot dogs in Houston. 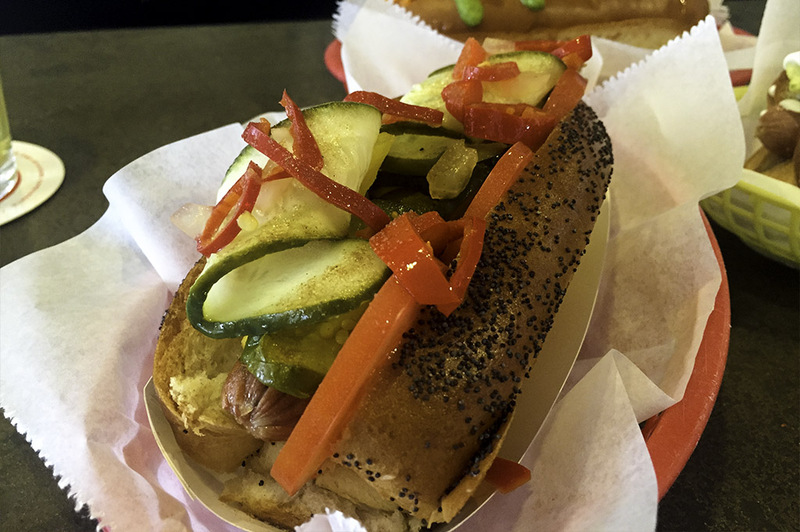 While there are a number of hot dog variations on the menu, we thought we would pick just a few and give them a try. 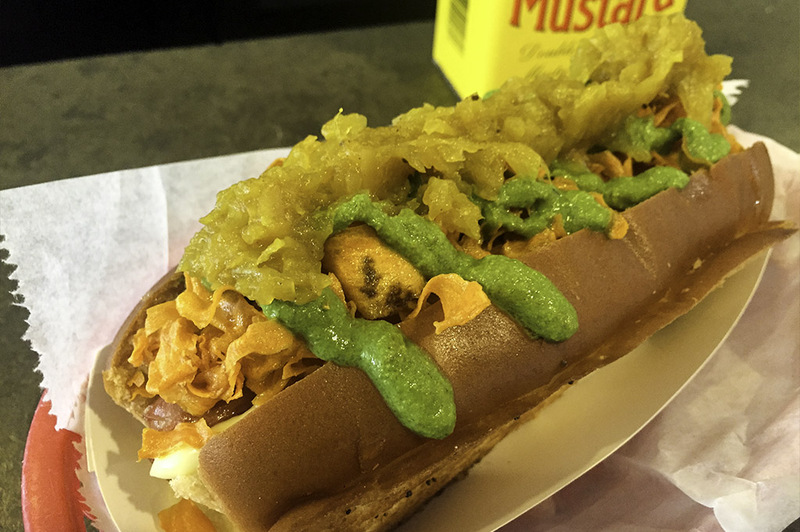 We ordered the Chi-Town Dog, Curryous Frank and the Texican Dog. 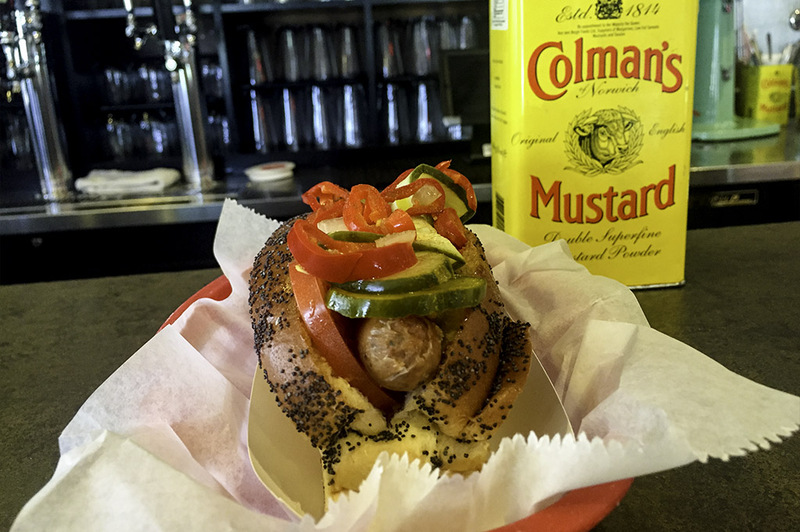 The Chi-Town Dog was a delicious medley of fresh tomato and dill pickle slices, short bus mustard, Sweet Blakeslee Relish, pickled fresno peppers and celery salt served on poppy seed bun. The super fresh veggies combined with the homemade mustard would make Al Capone roll over in his grave. 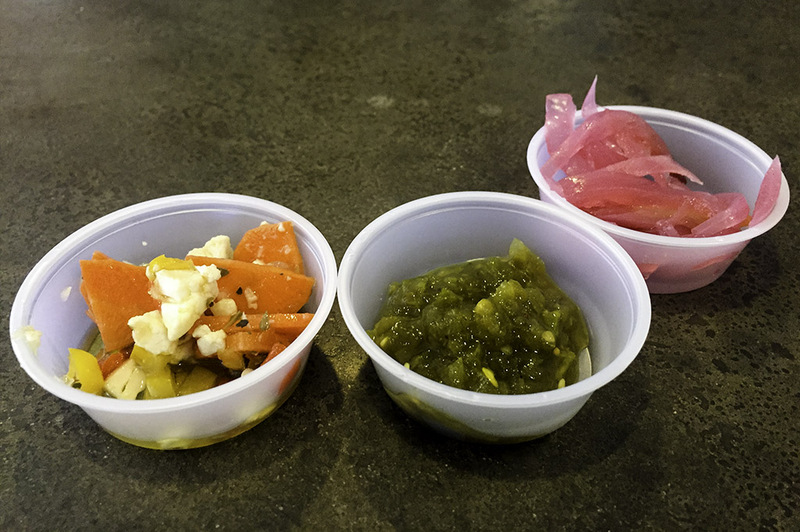 Come to find out, the peppers and pickles are all done in house as well, nice! Next up, we thought we would go out on a limb a bit with the Curryous Frank, which consisted of a wonderfully curried scooter onion relish, cilantro chutney, sweet potato crisps, sriracha ketchup topped off with roasted garlic aioli. Definitely not the normal taste you’d expect when biting into your classic street dog! But then, we didn’t come to Good Dog Houston for street food. The curry gave the hot dog a great flavor and the sweet potato crisps with the sriracha ketchup provided that sweet and spicy kick, delivering a unique taste we both enjoyed. And, to top it all off, the Good Houston Dog signature bun was really rich and buttery! I saved what was to be my favorite hot dog of the three for last. 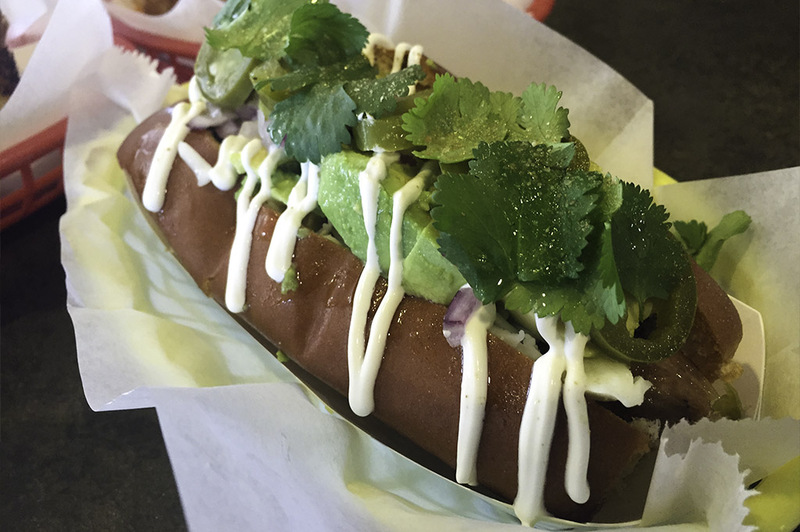 Made with refried black beans, Oaxaca cheese, avocado, pickled jalapeño, red onion, crème fraîche, cilantro, cumin and lime, the Texican Dog was out-of-this-world delish! The mixture of fresh vegetables, spices and refried black beans would make any Texican proud. I had to put it down for a second and sit there so I could really take in all the wonderful flavors. I absolutely love being in Texas. You just don’t get these immense Tex Mex flavors in other parts of the United States. 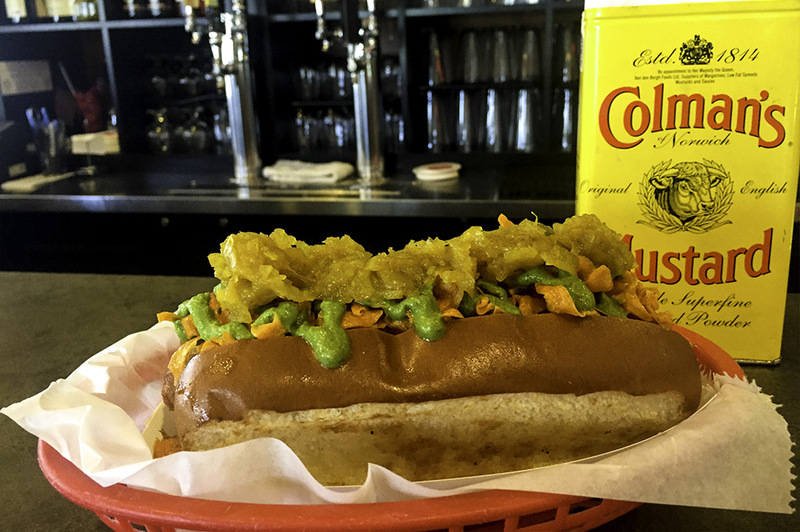 Let’s just say that this won’t be the last Texican Dog this Texan enjoys. Ha, ha, haaaaaa… and now for one of my favorite parts of the dining experience, dessert! If you have been reading my reviews for awhile, you know a meal is never really over without dessert. 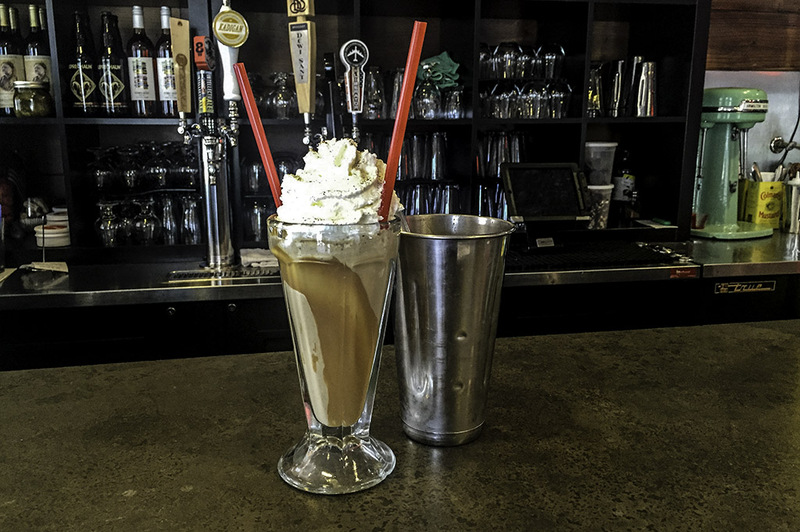 We enjoyed the Cajeta & Caphin Milkshake: goat’s milk caramel with local ice coffee made with Fat Cat Creamery Ice Cream. What? I thought Blue Bell was the best ice cream in the country. How things have changed in the H! 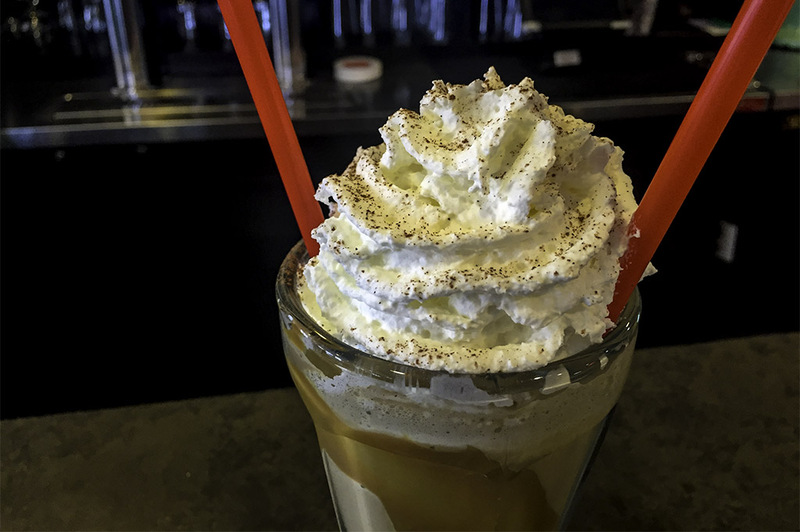 The Fat Cat Creamery ice cream along with the coffee and caramel put this milkshake over the top. 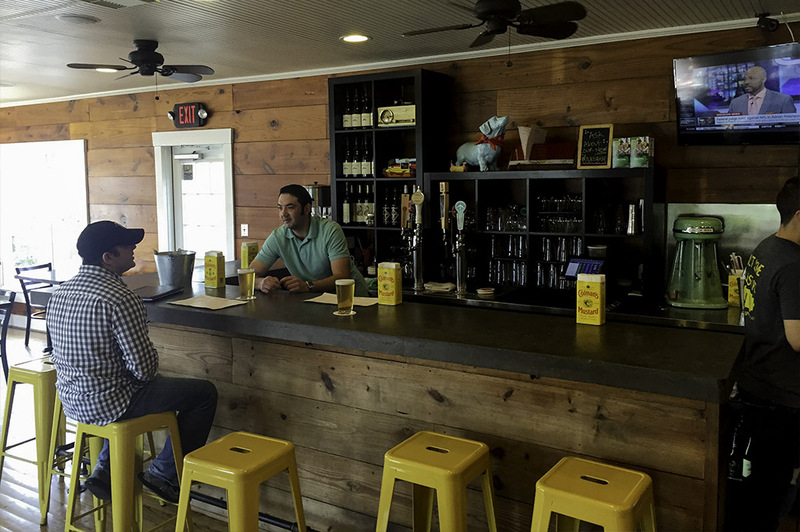 Come to find out, the Fat Cat Creamery is located just blocks away in the Heights. You can bet I will be over there soon. Let’s just say, save room for dessert!